Truth be told I am about 3 months late practicing how to decorate cookies. The plan was to make El Dia Los Muertos (Day of the Dead) Sugar Skull cookies, as I love all things macabre and skulls being my focal point in this genre. There should have been a post November 1st 2013, but I had so many Halloween posts leading up to that day that I thought I should relax a bit. I also put a hold on it as I haden’t practiced or got myself all the tools needed, even though I had the sugar skull cookie cutters from my prize money for my Mini-Jumble Berry Tarts. Christmas rolls around and Bulk Barn is now selling pre-made gingerbread cookies and houses and royal icing. That’s perfect for me as I can just concentrate on the decorating aspect and not worry about making the gingerbread. I bought my supplies and what happens again, I have so many Christmas recipes and posts that I run out of time. Now it’s the first week in January and I am practicing now. The only good thing to my procrastination was that everyone in my life for Christmas either gave me cooking, baking or photography related presents and my second mom (she’s more like big sister and mom – my mom has always said if anything should happen to her this is my new mom) and that’s exactly how it worked out. Anyway back to the story, she and one of her sons (my god-son) gave me a unique measuring cup set that looks like seashells, as my god son thought they were unique just like his aunty C.C. and an icing pen set with all the decorating tips and the much needed offset spatula. Now I had everything I needed and I had no excuse, and I broke in my new icing set. 2. Pipe outlines around the edges of the cookie. 3. Let the outline set for 1 hour before flooding the interior. 4. Thin the icing in the microwave or add a little water at a time until runny. 5. 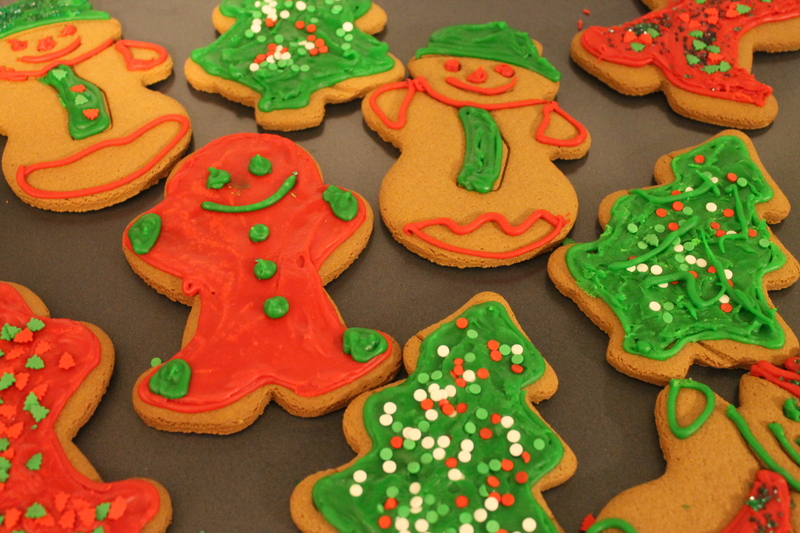 Let the icing stand for 5 minutes to allow bubbles to rise to the top and then flood the cookies inside your outlines. 6. Use an offset spatula along with a toothpick to help the icing reach the edges. 7. Let cookies set for 1 hour and then pipe details or the next colour on top. Or when you have finished flooding the cookie sprinkle the sprinkles, quinns or coloured sugar on top immediately so they can adhere to the icing. •	I found it easier to work with the royal icing if it was slightly warm to get a more liquid consistency. •	Another option is to add water, a little at a time until the runny texture is achieved. My first cookies was a real disaster, you can always tell your first when your practicing something new. By the second cookie I had the hang of it (I was expecting this to take me longer, but maybe my artistic background kicked it). For my first practice at cookie decorating I am quite pleased with myself. I just have to work on my flooding technique and using the offset spatula. I am now feeling more confident and by November 1st 2014 I will have that El Dia Los Muertos (Day of the Dead) Sugar Skull cookies post up for you to try.